Inventory: The Switch Fork — WETHEPEOPLE BIKE CO. The SWITCH Fork was one of those products which just made sense. An evolution from his signature SWITCH Bar, Mike Curley is renowned for his Jedi like front wheel balance, so the idea to make him a signature fork with a super short offset was one welcomed by open arms. 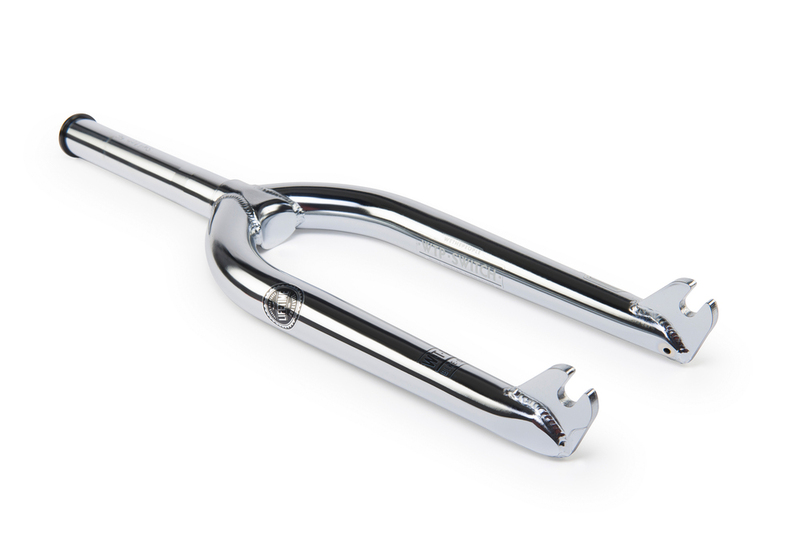 Mike's SWITCH Fork features a nimble 23mm offset, making it our shortest offset street fork yet. However don't let that fool you into thinking this fork is a one trick pony. We spent a lot of time discussing with Mike what would make his "perfect" fork, and integrated a lot of unique features into the design which really sets the fork apart from others on the market. Having pretty much every Hang and Whiplash variation down to a fine art, Mike spends a lot of time with his feet on his front pegs. We took this into consideration, and to help him with these tricks, we mechanically formed the fork leg at the very bottom near the dropouts, so that he could place his feet closer to the centre of the hub and balance better. When we designed the new Switch fork we wanted to create the strongest fork possible. One of the weak points of any fork with a CNC dropout is the welding between the blade and the dropout. To strengthen this joint we're not only using a super strong thicker than normal 6mm CNC dropout and a one piece formed fork leg, we also decided to slot the dropout into the actual blade of the fork. By slotting the one piece formed fork leg and then insert the dropout into the slot the dropout and leg naturally supports each other and also creates a much stronger weld joint. Even though this is the first time we've done this on a fork, we've actually used this very same technique with great results for a long time on most of our CNC dropout frames. Another cool feature on the SWITCH Fork which you probably didn't notice at first was the capped fork crown. Instead of leaving the crown open like most forks, we decided to use a special cap, which not only gives the fork a super smooth and unique look, but also more kind to your feet on tricks where you wedge your feet under the crown like Footjams. The SWITCH fork is available now at Wethepeople dealers worldwide in Glossy Black, Matt Black or Chrome. Like ALL of our forks, the SWITCH fork is backed up by our full LIFETIME GUARANTEE.